Though Jefferson County Public School’s (JCPS) integration plan began with a court order, district leaders successfully designed a socioeconomic desegregation plan that continues on a voluntary basis today. JCPS, which includes the city of Louisville and suburbs in the surrounding county, assigns students to schools based upon family preference and the target school diversity index range. Support for the program among JCPS parents remains remarkably high, with more than 90 percent of parents agreeing that diverse school provide educational benefits for their children. Jefferson County Public Schools (JCPS) has a large geographic area and a diverse populace to draw upon for system-wide school diversity efforts. The division comprises one-seventh of all students in Kentucky public schools and is the 28th largest school district in the country. Encompassing the city of Louisville and the surrounding county, JCPS today has over 100,000 pre-K–12 students in 166 school sites, with a demographic composition that is 46 percent white, 37 percent African American, and 17 percent other, including a rapidly growing Latino or Hispanic population.1 Roughly 66 percent of students are eligible for free or reduced-price lunch. These attributes are both a result of, and a contributor to, an extensive history of racial and socioeconomic integration in JCPS that began with legal enforcement but continues as a result of the commitment of district leaders and community members. The very existence of the joint city-county school district is rooted in enforced desegregation decisions, yet today JCPS maintains a voluntary and ongoing commitment to school diversity. After a desegregation order by the 6th U.S. Circuit Court of Appeals, the once-separate city and county school systems merged and adopted a single desegregation plan in 1974.2 This mandatory plan continued through 1978 when the courts ended active oversight. JCPS’s present-day student assignment plan strives to balance the dual goals of providing family choice among school options with diversity in school enrollment. To do so at the elementary level, the district has categorized every census block within its geographic boundaries based upon that area’s average household income, percentage of white residents, and educational attainment (see Figure 1). Based upon the number of students attending a school from each of those three categories, each school receives a diversity index rating, with a goal to keep each school’s enrollment within an index range from 1.4 to 2.5. Note: Each student is classified as a category 1,2, or 3, based on the category of the block group in which the student resides. A School’s diversity index is calculated as a weighted average of the number of students who attend from each diversity category. The district’s goal is for each school’s diversity index to fall within the range of 1.4 to 2.5. Source: Dena Dossett, Chief of Data Management, Planning and Program Evaluation, Jefferson County Public Schools. Lincoln Elementary Kusun Ensemble African dancers. Source: Jefferson County Public Schools. At the secondary level, students are assigned to a school of residence within regional clusters, which have been drawn to maximize the diversity of those neighborhoods. The sustained efforts to support school integration in JCPS have resulted not only in more integrated schools but in high levels of parent satisfaction, and better outcomes for students. According to Dossett, all but fourteen of its 134 schools (which does not include special/alternative programs with other placement requirements) has a Diversity Index within the district guidelines. The path to this successful growth and diversity wasn’t simple. Susan French-Epps, Lincoln’s principal, has been with JCPS for twenty-seven years and principal of Lincoln Performing Arts School since 2011. It took Susan’s seventeen previous years of turnaround experience and a combination of additional ingredients to bring the school back from the brink of closure. 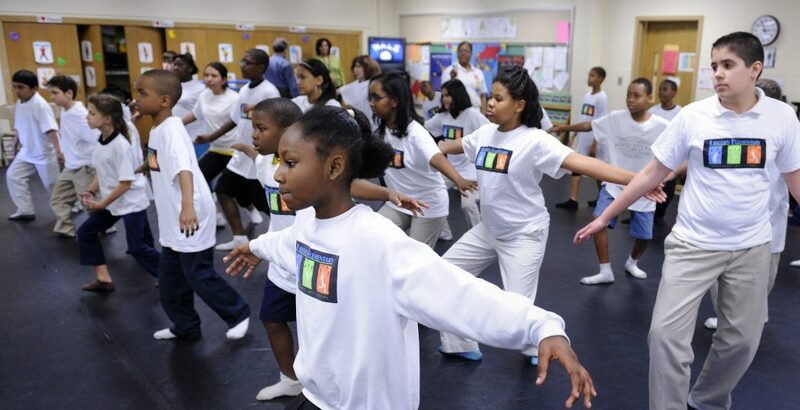 The district directed resources to the school to create a performing arts magnet with a focus on drama, dance, and music. The principal focused her hiring efforts on staff members who shared the vision and mission for an integrated arts program. Together, they infused the performing arts into its pedagogy, using the arts not as a supplement to academics but as a vehicle for learning and gaining knowledge. Source: Jefferson County Public Schools. To leverage the choice system, French-Epps and her assistant principal worked hard to market the revitalized program to parents and community members. They sent out a letter of introduction seeking members for a school advisory council and “hit the pavement and walked the street, handing out the letter and asking for their help,” the principal recalls. “We spent a year on it. We sent letters to existing families, began to market on social media, hosted booths and community events, visited daycares, and met with families. It was exhausting.” 16 But the team’s efforts paid off with enrollment as well as partnerships with families, businesses, and arts organizations that have flourished over the past five years. The diverse student body gives the school a diversity index of 1.89, a number that falls within the district’s target range of 1.4 to 2.5. This diversity index thus provides parameters that should prevent enrollment from concentrating students from homogenous social networks or residential areas by pulling in students from neighborhoods of varying income, racial composition, and family educational attainment levels. While legal challenges have receded, other challenges require continual planning and consideration. Family mobility remains an issue which commands the attention of school personnel. “A couple of hundred (students) move in and out of school every day,” notes Dossett.19 The system also must keep up with steady growth and changing demographics. It is now a “majority minority” district with the total number of students from racial minority categories exceeding the total number of white students. In addition, the system works to ensure equity and quality for rising numbers of low-income students and English language learners. District leaders recognize buy-in from school and community stakeholders as a key to the sustainability of the JCPS student assignment plan. Thus, as Dossett says, “we continue to work on educating the public and empowering families around the choice system.”26 For families, she notes, an important message is that “Kids are different, and what works for one might not work for another.”27 For community members, collecting and sharing data increases understanding. “Seventy percent of our residents don’t have school-age kids, so that’s a big number of people not engaged as parents. Their knowledge is often from when they were in school, and things have changed.”28 For example, when those not involved with the system assert that families only want neighborhood schools, the district relays that close to 48 percent of incoming kindergarten families choose a school outside of their neighborhood. In the years since the district merger, national media and scholarly attention continues to shine a light on the long path of school integration in JCPS, illustrating what occurs when school and community leaders remain dedicated to providing its students with the benefits of integrated schools. They do so because: “We see community-wide pride in our integration and diversity plan…we recognize the value in that.”30 This system’s perseverance leads many to view it as a North star that can guide others through a constellation of issues by balancing choice with equity to ensure diversity. By continuing its trajectory of commitment, the system can remain a bright example of preparing all students in the integrated, equitable, and stimulating learning environments they need and deserve. “Jefferson County Public Schools Student Demographics,” presentation at the Board Orientation of the Jefferson County Public School Board meeting, Louisville, Kentucky, January 10, 2015, 2015-16 JCPS Data Books. Allison Ross, “JCPS Desegregation Timeline,” Courier-Journal, September 3, 2015, Accessed August 8, 2016, http://www.courier-journal.com/story/news/education/2015/09/03/jcps-desegregation-timeline/71637432/. Genevieve Siegel-Hawley, When The Fences Come Down: Twenty-First-Century Lessons from Metropolitan School Desegregation (Chapel Hill: The University of North Carolina Press, 2016). Kindle Edition, 1342-1343. Dena Dossett, telephone interview July 8, 2016. Allison Ross, “JCPS Desegregation Timeline,” Courier-Journal, September 3, 2015, Accessed August 8, 2016. http://www.courier-journal.com/story/news/education/2015/09/03/jcps-desegregation-timeline/71637432/. Dena Dossett, email correspondence September 14, 2016. A. Semuels,“The City that Believed in Desegregation,” The Atlantic, March 27, 2015, http://www.theatlantic.com/business/archive/2015/03/the-city-that-believed-in-desegregation/388532/. Gary Orfield and Erica Frankenberg, “Experiencing Integration in Louisville: How Parents and Students See the Gains and Challenges,” The Civil Rights Project, University of California-Los Angeles, January 2011, https://civilrightsproject.ucla.edu/research/k-12-education/integration-and-diversity/experiencing-integration-in-louisville-how-parents-and-students-see-the-gains-and-challenges/LOUISVILLE_finalV3_12711.pdf, p. 2-3. Jefferson County Public Schools 2014-2015 Results Infographic, emailed by Dena Dossett, Chief of Data Management, Planning and Program Evaluation, Jefferson County Public Schools. Genevieve Siegel-Hawley, When Fences Come Down: Twenty-First-Century Lessons from Metropolitan School Desegregation (Chapel Hill: The University of North Carolina Press, 2016), Kindle Edition, citing Gary Orfield and Erica Frankenberg, Experiencing Integration in Louisville: How Parents and Students See the Gains and Challenges (Los Angeles: UCLA Civil Rights Project, 2011). Gary Orfield and Erica Frankenberg, Experiencing Integration in Louisville: How Parents and Students See the Gains and Challenges (Los Angeles: UCLA Civil Rights Project, 2011). Susan French-Epps, telephone interview August 4, 2016. Kim Bridges is a doctoral candidate in the Education Leadership program at the Harvard Graduate School of Education. Her studies focus on the challenges in urban school systems and racial/socioeconomic integration strategies to improve school environments and outcomes for all students. Kim has professional experience in public and nonprofit communications, teaching, and administration. Most recently, she was a senior policy analyst at the Virginia Department of Education. She also served as an elected member and as Chairman of the school board for Richmond Public Schools. Kim received her M.A. from the University of Richmond and a B.A. from the University of Virginia.